The Singaporean dollar tumbled to a 4-year low against the US dollar after the Monetary Authority unexpectedly stymied currency appreciation. The move is just the latest in the trend of weaker currencies in 2015. The unexpected move sent the Singapore dollar to 1.3570 against the US dollar, the lowest since 2010.The last time the bank intentionally slashed the appreciate rate of the currency was in 2011. Emerging Asian currencies - such as the Malaysian ringgit and the Thai baht - dropped on the move. In a surprise statement Wednesday, the Monetary Authority of Singapore said it would reduce the band of the currency. Singapore dollar's appreciation against a weighted basket of currencies, which the bank keeps confidential. The announcement was made far ahead of its scheduled meeting in April. 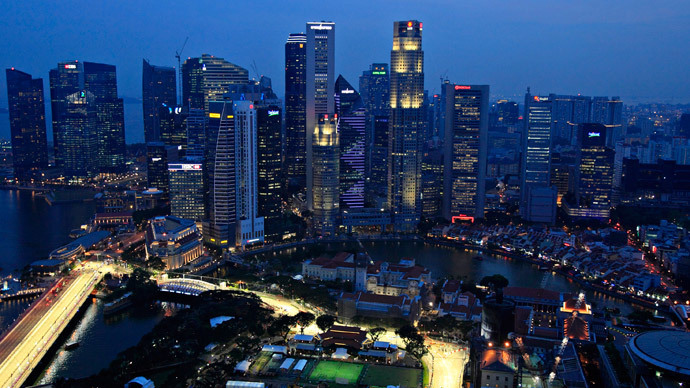 Singapore, a compact financial center, uses exchange rates instead of lending rates to control its currency, as it is a very trade-oriented economy. The bank also reduced its inflation target, forecasting a negative 0.5 percent in consumer prices for 2015. Wednesday’s move by the one of the world’s biggest financial centers comes on the heels of the Reserve Bank of India shock decision to cut reserve rates by 25 basis points to help bring down inflation. Hit by low oil prices and a lowered growth forecast for 2015, India, Japan, and Russia have all seen a drop in the value of their currencies. In November, Russia stopped regular currency interventions to allow the ruble to float freely, and Japan continues to print money to fight deflation, and India may again lower its lending rate next week. On January 22, the European Central Bank (ECB) announced a €1.14 trillion quantitative easing plan, which sent the euro to an 11-year low. A week before the ECB embarked on its easy money stimulus, the Swiss National Bank took precautions by removing the peg between the Swiss franc and the euro. This sent the currency soaring 15 percent.